I have always admired this sculpture of a family holding hands at the entrance to The Fair. It stands 15 feet high and is located on the corner of Coral Way and 107th avenue welcoming visitors to the Miami Dade Youth Fair. For as far as I can remember, my thoughts wondered “why is the dad not part of the sculpture?” So here is a playful sketch of the father with open arms, waiting to receive hugs and kisses from his wife and kids. Also a mystery was the artist who created it, since the sculpture does not have a plaque stating who the artist is. So I had to do some research to find out. Finally, I came across a local Miami artist’s page and there he was, posing in front of the sculpture in question. I got to contact him and his friendly personality made it a pleasure to write this article. His name is Ramon Lago. 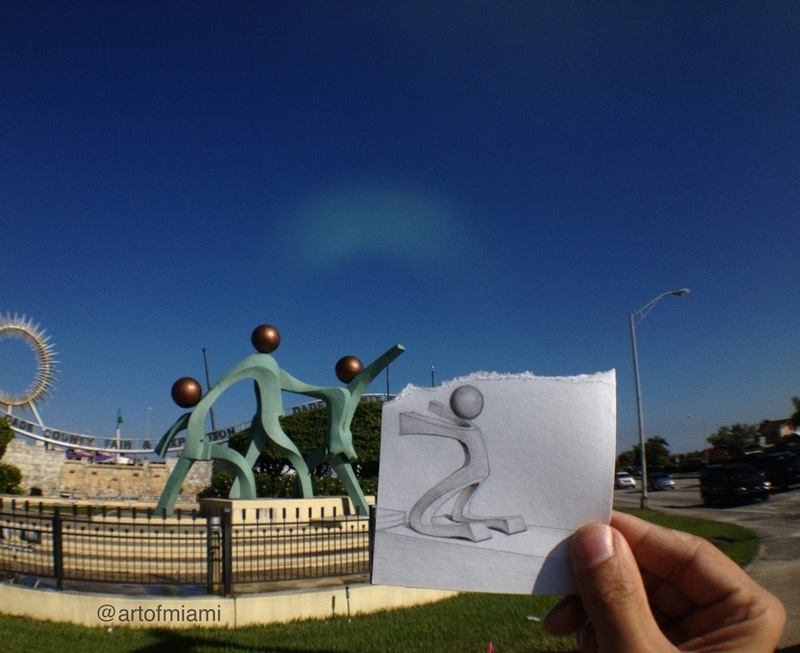 To make it clear, Ramon Lago is a sculptor which helped in transforming the logo of the family holding hands, into a large 3-D sculpture back in the late 1980′s. The designer of that logo, he said , was an artist by the name of Alexander Okum. Which I have no recollection. “I was working for a sub-contractor who did a lot of work for pattern shops and foundries, and since I specialized on fiberglass I got a lot of odd jobs like the hand railings columns, banisters water fountains etc in Disney world. There were a lot of things that were sub-contracted to my department , but I never knew where they came from , in this case there was a Russian stage designer who was very good in designing environments , in this case the entrance to the fair , they came to me with a design and I produced a fiberglass scale model about 15 inches high, then after it was approved I was told it would become 15 feet high, and it would be the centerpiece to the entrance . So in all fairness the design was conceived by Alexander Okum and I did the sculpture work. This year when you pass by the Youth Fair take time to appreciate its largest work of art and a beloved landmark of the our community. The MIami Dade Youth Fair begins today March 13-30. Click on link for directions.